* CB25 is applying highest and advanced technologies of Microcomputer controls, which is integrated in one equipment by electron. This is a sort of high technology cash binder, which can full automatically cross bind currency with cross binding or single binding. This model is friendly-user, easy operation and swift working efficiency for cash binding with aesthetics, firm and low consumption. It is able to bind quickly by hot press; you could properly adjust position of paper banding, sticking time, paper tape’s length and counting function to do perfect works. * This Model has best feedback from the Markets! 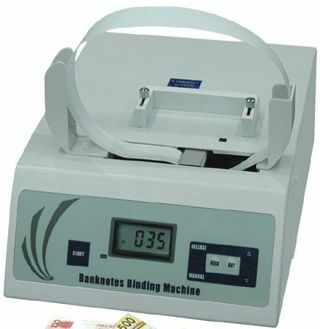 It is an ideal model for binding banknotes in banks, hotels, super markets, chained stores, customs and other financial areas, department and fields. * We also produce paper tape roll of Det. 25mm X 130m for users. * CB30 is adopting highest and advanced technologies of Microcomputer controls, which is integrated in one equipment by electron. This is a sort of high technology cash binder, which can full automatically cross bind currency with cross binding or single binding. This model is friendly-user, easy operation and swift working efficiency for cash binding with aesthetics, firm and low consumption. 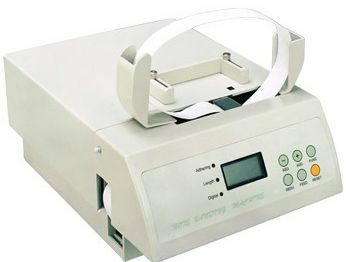 It is able to bind quickly by hot press; you could properly adjust position of paper banding, sticking time, paper tape’s length and counting function to do perfect works. * We also produce paper tape roll of Det. 30mm X 130m for users. * CB40 is adopting highest and advanced technologies of Microcomputer controls, which is integrated in one equipment by electron. This is a sort of high technology cash binder, which can full automatically cross bind currency with cross binding or single binding. 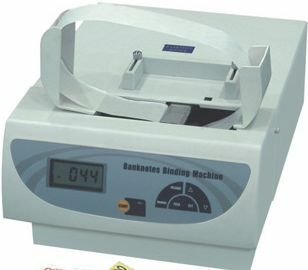 This model is friendly-user, easy operation and swift working efficiency for cash binding with aesthetics, firm and low consumption. It is able to bind quickly by hot press; you could properly adjust position of paper banding, sticking time, paper tape’s length and counting function to do perfect works. * We also produce paper tape roll of Det. 40mm/30mm X 130m for users.